Dr. Portugal graduated from Medical School in 1985 at the School of Medicine and Public Health, in Salvador, Brazil. She completed two pediatric residency programs; one at the Fundacao Hospitalar do Distrito Federal in Brasilia, Brazil and another at Blank Children’s Hospital in Des Moines, Iowa, United States. She is Board Certified by the American Academy of Pediatrics. She is the founder of First Choice Pediatrics, Inc. Special areas of interest are childhood asthma, headaches and infectious diseases. She is fluent in English, Portuguese and Spanish. Dr. Sison grew up in the province of Pampanga in the Philippines and graduated from the Far Eastern University – Nicanor Reyes Medical Foundation in Manila. 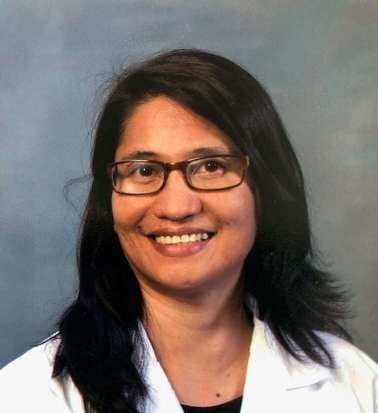 Her professional training began there as a Pediatric Resident and she later pursued a Pulmonary Fellowship at the Philippine Children’s Medical Center. After moving to the United States, Dr. Sison took Pediatric Residency Training at the Driscoll Children’s Hospital in Corpus Christi, which was affiliated with Texas A & M University. She is a diplomat of the American Board of Pediatrics & a Fellow of the American Academy of Pediatrics. Dr. Sison exemplifies an outstanding and heartfelt love of children. She is married and has a teenage daughter, who is active in high school sports. 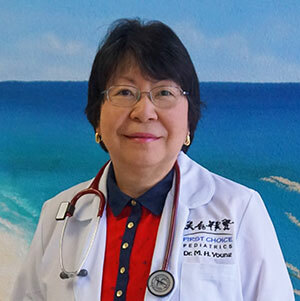 Dr. Young is a Board Certified Pediatrician. She received her medical degree at the University of the Philippines. She completed her pediatric residency training at SUNY Health Science Center in Brooklyn, NY. She has over ten years of private practice experience. She is a diplomat of the American Board of Pediatric and a fellow of the American Academy of Pediatrics. Besides English, she can also speak Mandarin and Tagalog. Dr. Chang was born in Taiwan and raised in the Dominican Republic. Being a son of a business man, he found his calling for medicine through his missionary godparents. 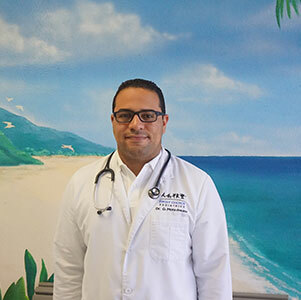 He graduated from medical school at Iberoamerican University in Santo Domingo, and completed his Pediatrics residency in NYU at the Woodhull Medical Center. He is a very passionate physician with a tremendous love for children and devotion for medicine. He speaks English and Spanish fluently. Dr. Mota is a Dominican native. Inspired by his mother who is a Pediatrician, he finished his Medical school at the Instituto Tecnologico de Santo Domingo (INTEC) in Dominican Republic. He moved to New York to pursue his dream of becoming a Pediatrician and completed his Pediatric Residency training at the Lincoln Medical and Mental Health Center, Weill Cornell Medical College in Bronx, NY. He has a special interest in preventive medicine and development. He is fluent in English and Spanish. Dr. Gavric is a Board Certified Pediatrician through the American Board of Pediatrics and a fellow of the American Academy of Pediatrics. She graduated from University of Sarajevo, Faculty of Medicine in Sarajevo,Bosnia and Herzegovina and completed her residency in General Medicine, Clinical Center Kosevo, Sarajevo, Bosnia and Herzegovina. After relocating to the United States, Dr. Gavric received specialty training in pediatrics at the Metropolitan Hospital Center, New York Medical College, NY. She has been working as a pediatrician in private practice in the Orlando area since the year 2007. Areas of special interest are Infectious and Skin disease, as well as ADHD/ADD. Dr. Gavric was recognized as one of America’s Top Pediatricians for 2011 by a nationwide peer survey. She speaks English, Serbo-Croat, and Bosnian fluently. Dr. Muhumuza is a native of Rwanda. He grew up in Atlanta, GA and attended The Morehouse School of Medicine in Atlanta, GA. He moved to Orlando to complete his pediatric residency at Arnold Palmer Hospital for Children. Dr. Muhumuza speaks English, Kinyarwanda and French. Dr. Danielle Lehoux was born and raised in the Dominican Republic. 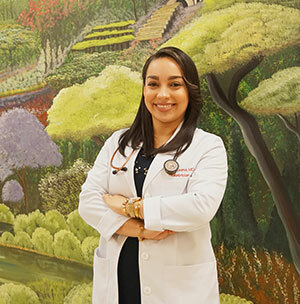 She graduated from Medical School from the Universidad Iberoamericana, Santo Domingo which there after continued with her pediatric residency at Woodhull Medical Center NYU, Brooklyn, NY. Her special interests include Emergency Pediatrics and Genetics. She is married, her husband’s name is Javier and they have one child. She is fluent in English and Spanish. Dr. Fioretti was born and raised in Rio de Janeiro, Brazil. She graduated from Medical School at the Universidade do Estado do Rio de Janeiro and received her first pediatrics degree from Hospital dos Servidores do Rio de Janeiro in 2009. She moved to the U.S. and continued to pursue her passion for childcare while working as a research fellow at Columbia University in New York. Dr. Fioretti completed her Pediatric training in the U.S. at the NYU Woodhull Medical Center with special interest in asthma and allergic disorders. She is fluent in Portuguese, English, Spanish, and speaks basic Italian. Dr. Anca Tomsa was born and raised in Romania. She obtained her Medical Degree from “Carol Davila” University of Medicine and Pharmacy in Bucharest, Romania. Her passion for linguistics and curiosity for foreign cultures brought Dr. Tomsa to the United States where she turned a childhood dream into reality. After completing Pediatric Residency Training at Woodhull Medical Center, NYU School of Medicine, in Brooklyn, NY she became a Board Certified Pediatrician. 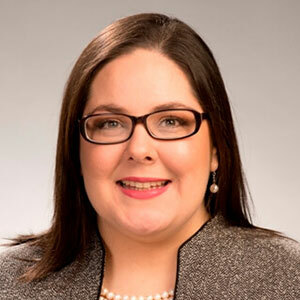 The residency experience brought about her desire to help improve the health of children with obesity related endocrinopathies living in communities with a high risk population. In 2016 Dr. Tomsa graduated from the Pediatric Endocrinology Fellowship at Texas Children’s Hospital, Baylor College of Medicine, Houston, TX. During her fellowship she further expanded the skills and medical knowledge which will allow her to provide excellent medical care to the patients in our community. She is fluent in Romanian, English, Spanish and proficient in French. Dr. Armstrong was born in New Port News, Virginia, and grew up in Reno, NV before moving to Winter Garden, FL as a young teenager. She attended the University of Florida, earning her Bachelors Degree in Health Science, before continuing on to medical school at the University of Central Florida College of Medicine as a member of the founding classes. She then completed her pediatric residency at the University of South Florida in Tampa. Her interests within pediatrics include mental and behavioral health, adolescent health, and watching families grow up! When she is not working, she loves spending time with her husband, Danny, and her two young children. She is excited to return to her home town and join the First Choice Pediatrics Family!. Josue H. Cortes graduated from medical school at Loma Linda University School of Medicine in southern California. He completed his residency at Loma Linda University Children’s Hospital. 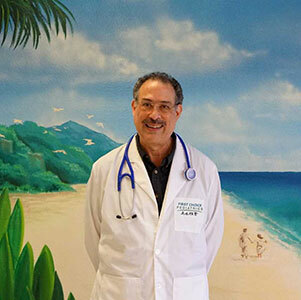 He then came to Florida where he has practiced for the last 13 years as a board certified pediatrician. Dr. Cortes is fully bilingual, English and Spanish. He truly enjoys the time he spends with his patients and their families, and he loves practicing every aspect of pediatric medicine. Dr Imp grew up in New Jersey. She went to college and medical school at Duke University in Durham, NC. She trained in pediatrics at Indiana University and Riley Hospital for Children in Indianapolis, IN. After working in Indiana and then Wisconsin, she moved to Florida to get away from the cold. She enjoys taking care of children and has a special interest in asthma and allergies. During her time away from work she enjoys swimming, Disney, and spending time with her 2 boys. Dr. Urena was born and raised in the Dominican Republic. She grew up helping to take care of her sick grandmother, which caused her to fall in love with helping others. She graduated from medical school at the Instituto Tecnologico de Santo Domingo (INTEC) in Dominican Republic. Fearlessly pouring her heart out, she completed her Pediatric residency training at St. Barnabas Hospital, Albert Einstein School of Medicine, Bronx, N.Y. After medical school she completed a Master of Science in Clinical Nutrition degree. She has special interests in cross-cultural care, impact of immigration in children and families, and adolescent parents. She is fluent in English and Spanish. Dr. Draa received his certification from the American Academy of pediatrics in 2008. 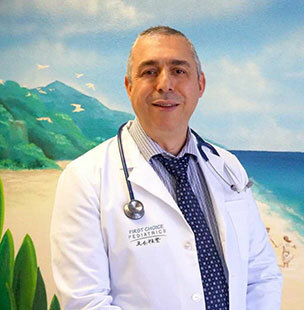 A long time pediatrician, he first graduated from the University of Constantine in Algeria then soon after he moved to Paris, France where he attended the Rene’ Descartes University and specialized in pediatrics. He practiced in Paris as a pediatrician for few years then moved to the USA. He attended residency at the Bronx Lebanon Hospital Center, affiliated with Albert Einstein college of medicine in Bronx, New York. He is fluent in English, French, Arabic and some Spanish. Dr. Milla finished his graduate and undergraduate education in 1984 at the National University of El Salvador in his native country. After completing his pediatric training at Cook County Children’s Hospital in Chicago, Illinois, he moved with his budding family to Gainesville, Florida in 1990, shortly after which he obtained his American Pediatric Board Certification, which he still holds. He practiced his specialty in Gainesville for the next 18 years and then moved to Jacksonville, Florida where he continued working from 2009 to 2018. Dr. Milla believes in having fun throughout the day with his young patients while providing them with a kind, competent, and compassionate health care. He also firmly believes in the integral role faith plays in the delivery of an excellent health care. He currently lives in Lake Mary, Florida with his wife of 32 years with whom he has three grown up children, with their oldest son just completed DO medical school at Lincoln Memorial University in Harrogate, Tennessee and who has begun training in Internal Medicine at Shand’s Hospital in Gainesville, Florida. Their married daughter and her husband work both as veterinary technicians at the Veterinary School in Gainesville, Florida. Their youngest son is an actor graduated from Emerson College in Boston, Massachusetts and is currently pursuing his dream of performing voice over acting for animated movies in Los Angeles, California. Dr. Dao was born in Boise, Idaho but grew up in Orlando, Florida. She completed her Bachelor’s Degree in Nutritional Sciences at The University of Florida, then moved to California where she earned her Master’s Degree in Public Health at Touro University. Dr. Dao subsequently completed medical school at West Virginia School of Osteopathic Medicine and finished her pediatric residency at The Children’s Hospital at Palms West in West Palm Beach, Florida. Dr. Dao truly enjoys guiding families as they welcome their little ones into the world. In her free time, she enjoys traveling, sight-seeing, going to the beach and spending time with her fiancé and family. Dr. Roques was born and raised in the Dominican Republic where he attended Medical school at Universidad Iberoamericana UNIBE. He moved to New York City to complete his Pediatric Residency training at the Lincoln Medical and Mental Health Center, Weill Cornell Medical College in Bronx, NY. He has a special interest in preventive medicine and research. He completed a research fellowship under the ECRIP program at Lincoln Medical and Mental Health Center. He is fluent in English and Spanish. Dr. Diaz graduated from medical school in Universidad Iberoamericana in Dominican Republic. After medical school, she realized Pediatrics as her field to pursue by working in the pediatric unit of IDEV. She completed her Pediatric Residency in Lincoln Medical Center in the Bronx, NY. Dr. Diaz is interested in preventive pediatrics and helping communities in need. During childhood and adolescent years, she had the opportunity to work in the family business: a pharmacy, where her interest in medicine began to grow. Dr. Diaz was born and raised in Dominican Republic, and enjoys spending time with family, reading, sightseeing, and is fluent in Spanish and English. 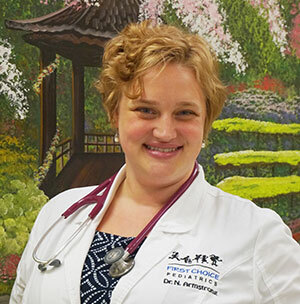 Dr. Amy Lucier was born and raised in Costa Rica. She graduated from medical school at Escuela Autonoma de Ciencias Medicas (UCIMED) and worked as a general practitioner for two years, helping children from underserved communities. She was accepted into pediatrics residency and finished one and a half years of pediatric training in Costa Rica before coming to the United States. She completed her pediatric residency as chief resident at Woodhull Medical Center, New York University, in Brooklyn, NY. 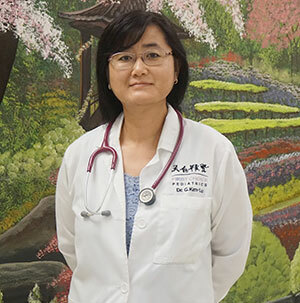 Her interests include hematuria, proteinuria, and breastfeeding. 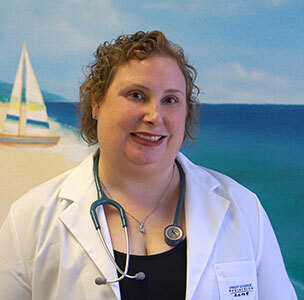 Dr. Lucier is fluent in English and Spanish, and is a board-certified pediatrician. During her downtime, she enjoys spending time at the beach, spending time with her husband and playing with her cats. Dr. Joanne Dela Pena Arce was born and raised in Cebu, Philippines. She earned her Medical degree from Poznan University of Medical Sciences in Poland. She then completed her Pediatric residency at the University of Tennessee, College of Medicine Chattanooga. She has a special interest in providing preventive and anticipatory guidance during well visits. She loves spending time with her husband and family. Dr. Dela Pena is board certified and is fluent in English and Tagalog.